Most importantly, the girl is able to glide through the air for a bit, as long as she maintains her momentum, allowing her to curve under low overhangs, reach out-of-the-way pickups, and navigate between obstacles. 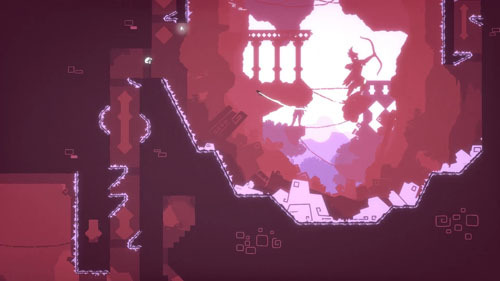 She can’t make very tight turns, and must keep moving to stay aloft, so players must master the controls in order to keep her moving through the air. 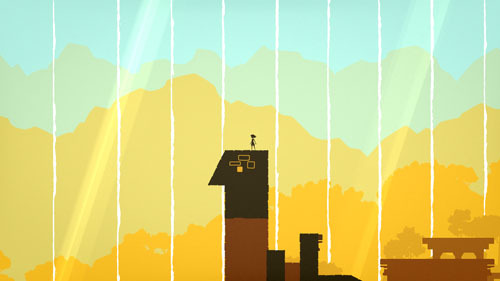 The game has a heavy focus on atmosphere, with five themed areas designed with layered color gradient backgrounds. 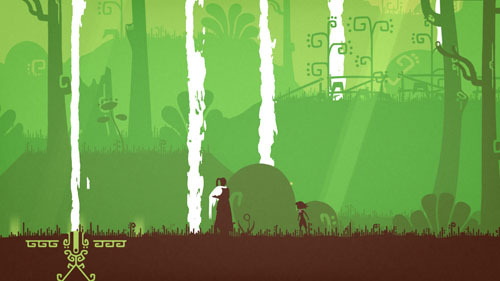 Characters and objects are represented in solid dark colors with white used as the primary highlight to emphasize movement, offering trails of white behind the protagonist as she runs and glides, and bursts of flame when checkpoint streetlamps are lit. The game features an upbeat soundtrack filled with vocalizations and woodwind instruments, giving it a lighthearted fantasy feel, which is directly opposed to other dark platformers that offer high action themes or somber melodies. But despite the generally cheery feel, the player can expect to meet his untimely end quite frequently. 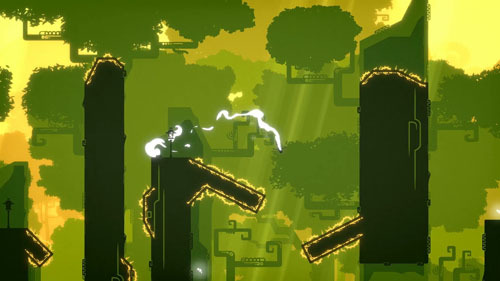 The game features no enemies, and so gameplay focuses entirely around environmental navigation. The world offers a mixture of natural environments and constructed ones, with most environmental traversal done across flat manmade surfaces, and natural elements appearing as backgrounds, highlights, or obstacles, such as thorn bushes or pools of water. Coming in contact with any of these deadly elements kills the protagonist on contact, sending her back to the most recent checkpoint streetlamp. These checkpoints appear frequently, but the tasks that must be completed between them are often quite difficult, resulting in frustration as a precise sequence of dashes, jumps, and glides must be performed multiple times in order to survive to the next streetlamp. 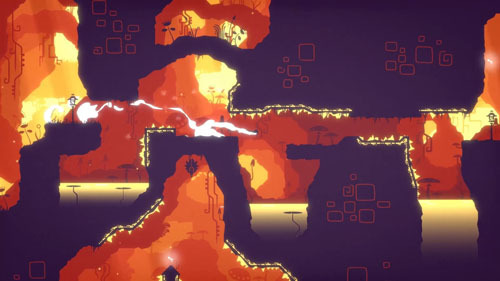 Despite the apparent freedom allowed by granting the protagonist the power of limited flight, levels are designed with very little room for experimentation, and recovering from mistakes is difficult due to the need to maintain momentum. Specific sequences of moves must be performed to overcome most obstacles, with mistimed button presses generally resulting in death, or a fall back into a lower section to repeat your actions. 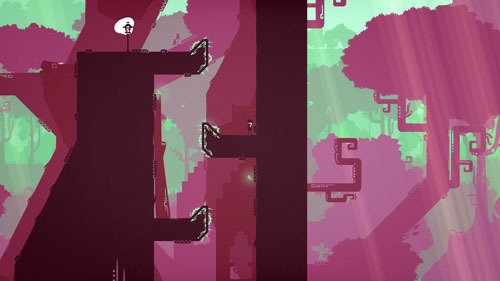 Once the player escapes the confines of the village – which acts as a consequence-free environment to try out the controls – he enters a wooded area and encounters a number of doorways with mysterious symbols on them. Most of these doors are locked at the start of the game, but finding an unlocked one allows the player to transport himself to one of the themed areas to undergo a set of challenges. 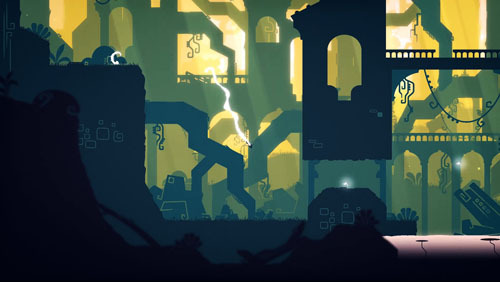 Once teleported, the player finds a set of four shrine-like structures, which represent individual levels, and these may be completed in any order. Completing these levels allows the player to open up new doorways in the hub area that lead to new level sets. Each shrine has an indicator showing whether or not the corresponding level has been completed, and each level contains a certain number of sprite-like creatures that may be collected along the way. 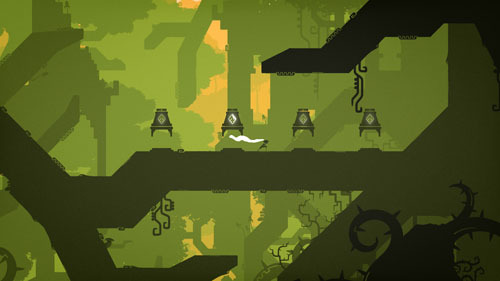 Some of these creatures appear along the natural route for navigating the level, while others appear slightly off the beaten path and require advanced techniques to reach, although all are optional for level completion. When the player collects a sprite, it flies alongside him as he moves through the level, and some levels feature more than a dozen such creatures, which offers a visual representation of accomplishment as the player accumulates more and more of them. However, given the game’s high resolution and zoomed out camera, it’s possible to overlook some sprites entirely, especially when moving along at high speeds. Also, if the player is killed before he reaches the next checkpoint, he must collect the sprite again in order to keep it. The primary issue with collecting all of the sprites within a level is the limited allowance for experimentation or failure, with mistakes or even slight missteps resulting in repeated gameplay. This means that the player may see a sprite, understand how to get to it, and still opt against doing so in order to avoid the penalties for failure. 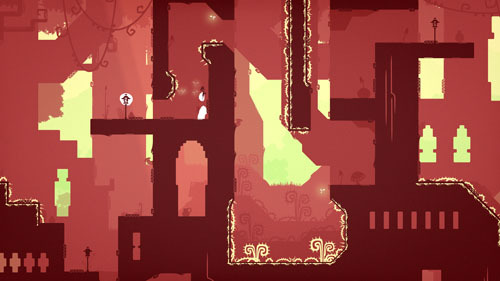 These hard-to-reach sprites represent organic difficulty to reward skilled players, but even completing a level’s most straightforward route requires advanced techniques and a high degree of technical mastery, and is therefore unfriendly to newcomers. The developer seems to have understood that this rigidity might cause players to get stuck or simply become too frustrated to continue, so they added an assist mode to tweak various aspects of the game, such as granting unlimited flight, invulnerability, or simply skipping ahead to the next checkpoint. 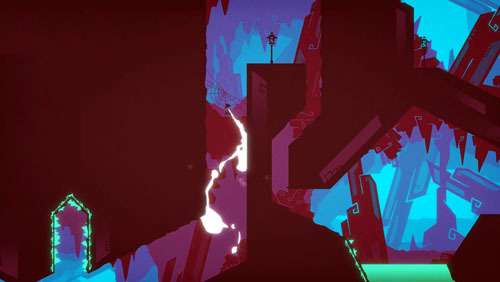 As such, the player must either keep playing until he masters the mechanics or admit failure and go into a menu to make the game easier. 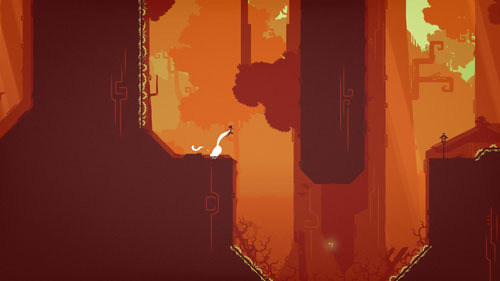 The King’s Bird was developed by Serenity Forge, the studio that previously published Four Sided Fantasy, Luna’s Wandering Stars, and Pixel Galaxy. The game was published by Graffiti Games, which previously published Double Cross and Joggernauts.